Have you been in such situations where you have missed or forget to call somebody in your family or friends or in social relations and felt guilty for being busy and not calling them. Most of the times it happens that people forget to call their friends or family members on their birthdays, wedding anniversaries or any other important events which are memorable for them and being in a relation, they expect a call wishing them from your side. But, as we are so busy in our life that we simply forget to call that person which posses so much importance in our life. Neither we can stop doing our job/business nor we want to make that person unhappy just because of our fault. Many a times, it happens also that we force our self to keep such thing in our mind and we do too but when the moment of call comes, we forgets it again. In Such cases, we feel how good it would be if someone could make a call automatically or just remind us to call to that person when the moment arrives. Now a days when things are going mobile, it’s make a better sense to seek such an app that can do all this functionality and which could be installed in our mobile devices. Future scheduler is such an app developed by appsicum team and available for all major operating platforms like iphone, android and blackberry. 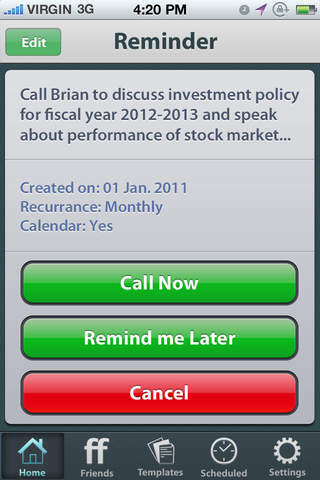 This App not only lets you schedule your calls but also texts, emails and social posts on future date and time. Lets See How You can Schedule a Basic Call on Future Date and Time With it. First Screen when you will be opening app will be like this. In which you have to tap on call icon if you want to make a call scheduled on future date and time. 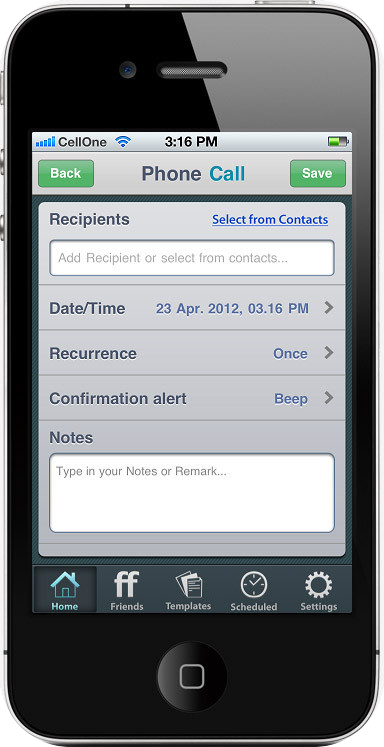 On Second Screen, you can choose the contacts, date and time to make call,Recurrence Priority, Confirmation Alert Type and Notes if you like to set any kind of reminder message attached with it and then click save. 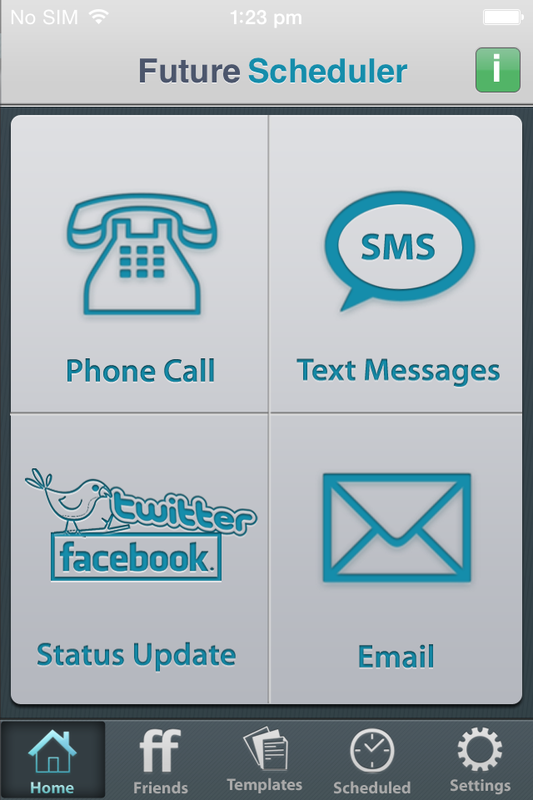 Your call will be saved under scheduled tab located at the bottom of app. 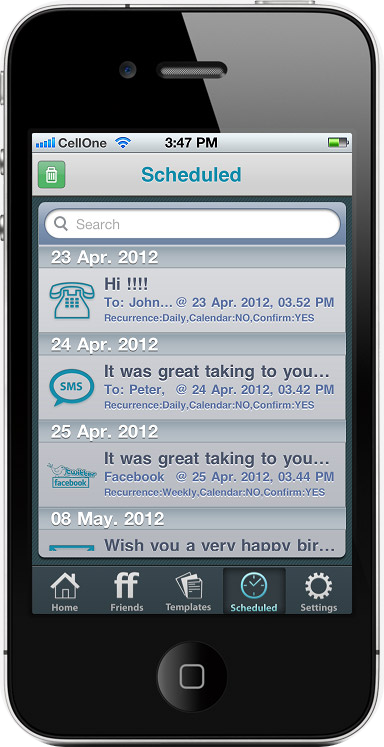 When the scheduled date and time will arrive, app will automatically trigger the call. Don’t worry if you don’t want to make call’s automatically and want to confirm it first with you before making any call, you can check the confirmation alert radio button while scheduling a call. If you will set confirmation alert “On”, a screen will be appearing like this to make confirmation. So, As Elaborated, it was just a 2 -Step process to schedule a call and forget. From Now, Future scheduler will be responsible of reminding it to you. It works as your personal assistant as mentioned earlier that it is capable of scheduling emails, sms/texts and social media posts also on future date and time. So now never forget anything and keep your whole day schedule on Future Scheduler.